The IBM InfoPrint 4247-X03, a professional high speed impact printer, prints at speeds of up to 800 cps in Data Processing (DP) mode. Other print-quality choices are DP Text, Near Letter Quality (NLQ) Gothic, NLQ Courier, OCR-A, and OCR-B. The 4247-X03 is an office and industrial dot matrix printer that provides multiple forms paper handling capabilities on up to 8-part carbonless forms. This Infoprint 4247 printer is designed to meet mid-volume output requirements and to provide reliable supply chain printing at an attractive total cost of ownership. A low-cost alternative to laser technology, the InfoPrint 4247-X03 can deliver broad forms flexibility, support for wide format printing, and the convenience of remote printer management when LAN-attached. The IBM InfoPrint 4247-X03 can have either one or two straight continuous-forms paper paths for outstanding paper-feeding reliability. One paper path is standard; the second path is an optional feature. Typical applications include transaction processing for invoices, office or internal business documents, as well as bar codes, labels, and multi-part forms. The IBM InfoPrint 4247-X03 Printer allows exceptional forms-handling flexibility. The base printer includes one continuous-forms tractor path; a second continuous-forms front tractor paper path is optional. IBM no longer sells the 4247-X03 or any InfoPrint Printers. 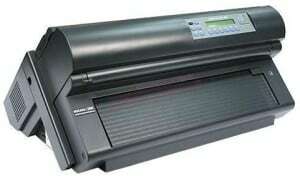 The 4247 dot matrix printers were manufactured by CompuPrint for IBM.